Winning six of eight games, the UBC Okanagan Junior Heat claimed third place among 14 teams at the Canadian National Club Basketball Championships in Langley on the weekend. Both losses came at the hands of North Vancouver-based VK Basketball teams. The VK U17s defeated the Heat 68-62 in semifinal play and the VI U16s edged the Okanagan representatives 56-55 in the first round-robin game of the four-day tournament at the Langley Events Centre. VK downed its sister team, VK U16s, 71-58 in the championship game. In their semifinal, the Heat trailing by 12 points at the half and by as many as 18 in the third quarter, but fought back and took a two-point lead with four minutes remaining, only to see VK take advantage of a couple open looks down the stretch and claim the win. Kelsey Falk of Vernon, finishing with 18 points, scored eight straight in the second half to spark the comeback that also included inspirational play on defence by Kassidy Day, Melania Corrado and Jordan Kemper. 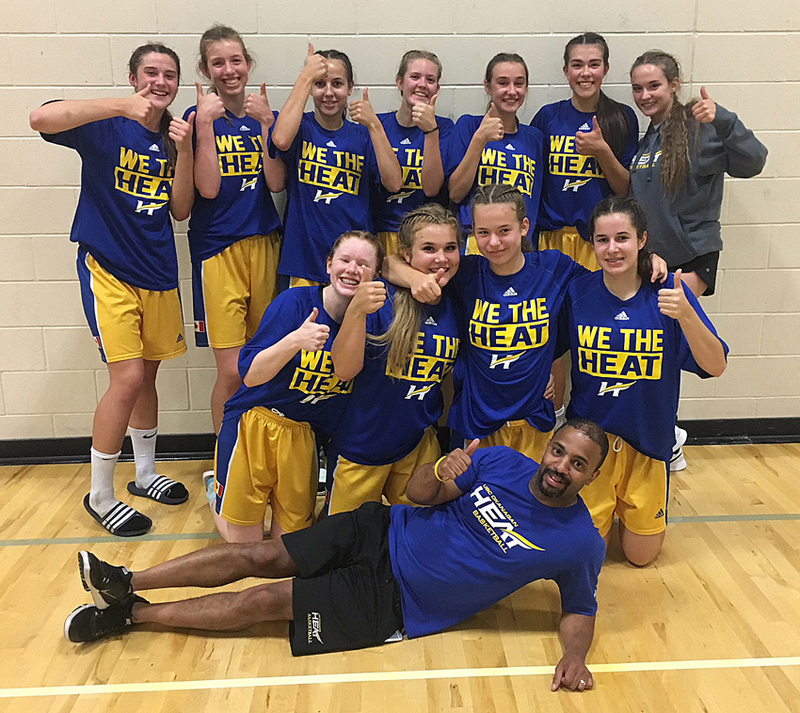 Kelowna’s Jaeli Ibbetson added 13 points and seven rebounds for the Heat who also received a nine-point effort from Naomi Kent. Head coach, Bobby Mitchell, said he was proud of the team’s grit after trailing by a large margin early in the second half. Mitchell conceded that finishing third was a disappointment for the team, but added the players should be proud of their accomplishments. The Heat had earned a berth in the semis by defeating Triple Threat Black of Vancouver 61-40 in their quarter-final game. A 13-point, six-rebound performance by Ibbetson led the Heat, while Day chipped in with 12 points to go along with Corrado’s eight. Following the loss to VK in their opening game, the Heat defeated the Swoosh U17s of Edmonton 56-17, the Storm Hawks of Manitoba 69-7, Triple Threat Orange 77-23, Calgary Warriors 78-31 and the Edmonton Grads 54-38.